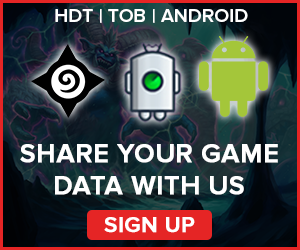 A weekly Hearthstone Meta Report based on data from nearly 27,000 games now with a LIVE (beta) tracker! 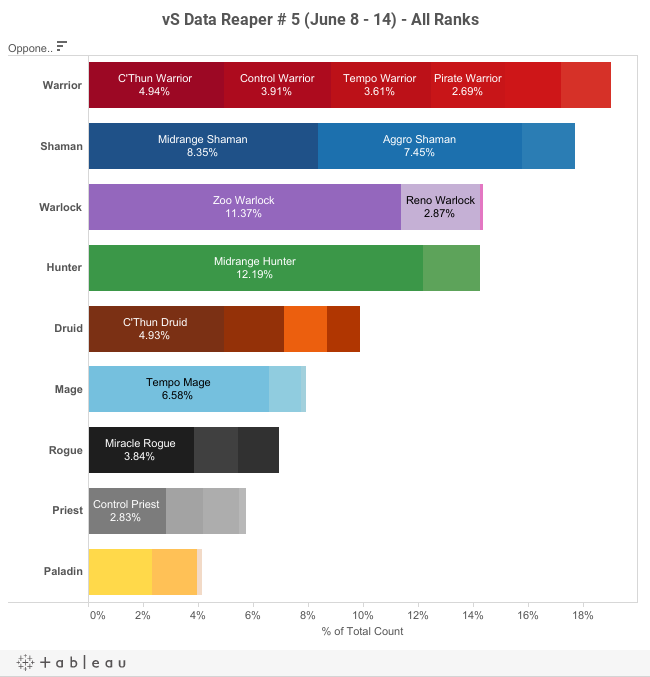 Welcome to the fifth edition of the Data Reaper report! This week, we are introducing several significant changes to the report as well as providing some updates on other developments. 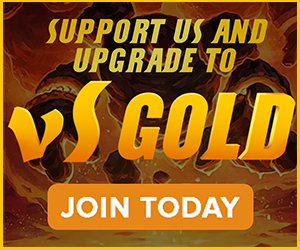 We have added Naramo to our team, together with the Live Meta Tracker that he built. This merge solves some technical constraints of the Google Sheet as our team is able to store and process the data outside of the sheet itself. Thanks to this addition, we are now officially announcing Data Reaper Live (Beta). This live tracker provides users with a view of what has been played on ladder over the past few hours. Though it’s currently in Google Sheet, we are working on developing a full-blown web application that will have new features as well as more interactivity with the user. The next iteration of Data Reaper Live will be announced in the next few weeks. Thanks to merge, as well as the response to it, we have added a significant number of additional trackers. We now have over 500 trackers, and during the past week we have compiled over 27,000 games. The more data we have, the more thorough and accurate our analysis will be. If you have not done so already, please sign up with your Track-O-Bot information below. We are adding the long awaited win rates chart, allowing you to evaluate how strong/weak different matchups are. The data is based on all games tracked in the past 30 days. We will maintain this sheet continuously and provide it to you every week. We have developed a new measure of deck strength called the vS Power Rankings. It is essentially the expected win rate that the deck is likely to present in the current Meta. 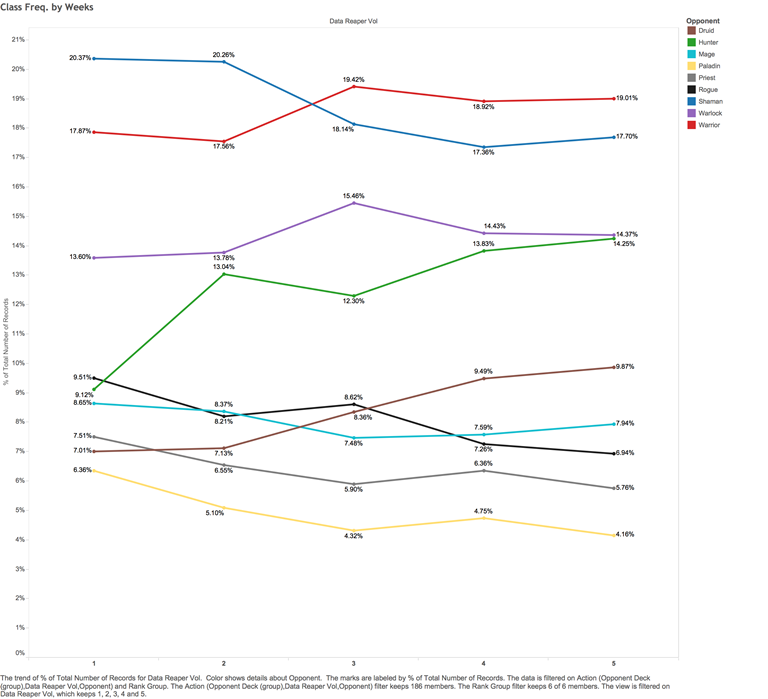 We base the vS Power Rankings on a deck’s actual win rates against specific archetypes over the past 30 days, and on the Meta composition over the past week. 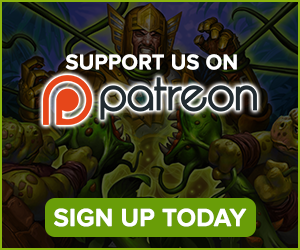 Due to popular demand, we opened a Patreon page, giving our interested and generous readers a way to directly support the Data Reaper team’s continuing efforts. We are thinking of ways we can provide special bonuses, or individual analysis/coaching to these potential supporters in the future. Outside that, our plan is to keep all content we produce free, and available to everyone in the community. We hope you enjoy the new features, and we welcome additional feedback you have for future additions to the report. Now let’s get down to the numbers. The following two charts show deck frequency of opponents, and we’ve made them more interactive (you can hover over the bars). The first chart shows all ranks, while the second chart gives you the option to switch between legend rank, ranks 5-1, ranks 6-10 and ranks 11-15. We’ve recorded about 1k games at legend, 6k games at rank 5-1, 9k games at rank 6-10 and 7k games at ranks 11-15. We also prepared a graph displaying the popularity of classes during the last five weeks, since we’ve launched the Data Reaper project. Aggro Shaman’s popularity is increasing significantly, especially at higher levels, at the expense of Mid-Range Shaman. The class is becoming faster and more aggressive. 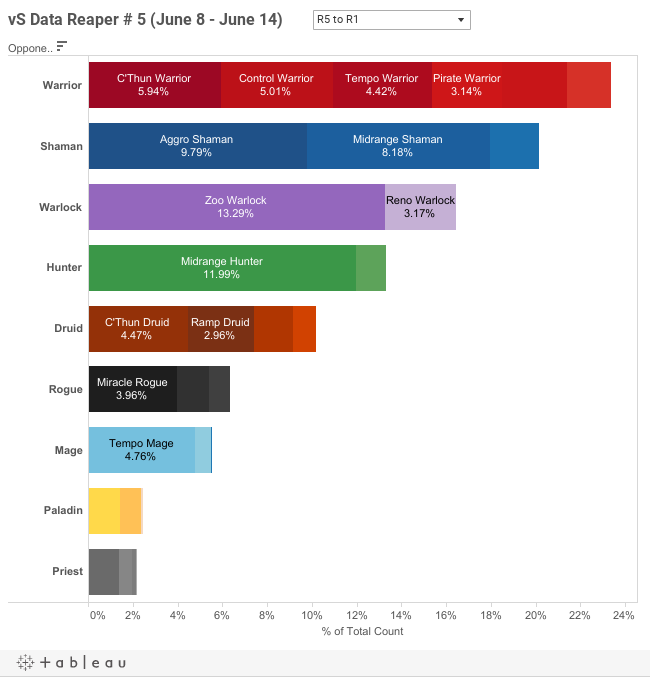 C’Thun Warrior has risen to become the most common Warrior archetype on ladder, while Tempo Warrior has taken a step back. Warlock continues its trend of being a more common class at legend rank, where it surpasses Shaman. Both Reno and Zoo archetypes display a pattern of increasing in frequency the better the rank is. Druid is continuing its steady increase in play, mostly on the back of C’Thun Druid’s increasing popularity. Tempo Mage is trending upwards, and the Mage class is the next one to surpass Rogue in overall popularity. However, Rogue still shows very respectable numbers at high levels of play. Now, let’s continue to our matchup chart. Note that we’ve taken measures to eliminate win rate bias resulting from our tracker population, in cases where our trackers are more proficient in a particular matchup than the average opponent. Thus, we now feel comfortable to finally report these numbers. We require a minimum of 100 games per matchup, so some matchups will have a blank cell (happens with less common decks). The larger our database grows, the easier it will be for us to do calculations for more matchups, and the more statistically accurate our calculated win rates will become. The table appears to be a bit daunting at first, but it’s very easy to understand. You can hover over the mosaic for information on every matchup. We’ll let the colors and the numbers on this one speak for themselves. Control Warrior’s position in the Metagame hasn’t changed much this week. We still see players such as VLPS consistently achieving high legend rankings with the archetype. The N’Zoth Control Warrior variant was made popular by Fibonacci when he piloted it to a high legend finish in May. Since then, the variant has been played on ladder as well as in tournaments. N’Zoth Warrior plays very similarly to the classic Control Warrior utilizing end game bombs such as Ysera. The difference is that the games feel like they don’t hinge on whether you get good legendaries off of The Golden Monkey, which is sometimes the case with standard Control Warrior. Tempo Warrior has seen great success at the European Championship with the winner, Thijs, utilizing it in his lineup. It is a strong deck to play on ladder and can certainly get you to high rankings. Dragon Warrior remains a very strong yet relatively fringe deck on ladder. Tempo Warrior, with its recent tournament success, seems to be overshadowing it. Despite its really good matchups against the field, it hasn’t caught on in tournaments yet either. No player brought it to the European championship last weekend. C’Thun Warrior’s popularity had surges in the last week to eclipse all the other Warrior archetypes and to become the most common Warrior deck. AKAWonder seems to have a passion for C’Thun decks and his list, which he brought to the European championship, is well thought out. C’Thun Warrior does better against the midrange decks than Control Warrior since it can combat their minions with its own and it possesses the potential to have insane swing turns for those matchups, such as an activated Ancient Shieldbearer, Twin Emperors or C’Thun himself. Whenever a C’Thun is drawn against a midrange deck such as Druid, Hunter, or Tempo Warrior, they can be blown out of the water, assuming the C’Thun has an attack value of at least 10. All eight players competing in the European Spring Championships brought Shaman to battle for a spot at Blizzcon. Five players brought Aggro Shaman while three players brought the Mid-Range archetype. Starting with the European champion, Thijs chose to bring the hybrid version of Aggro Shaman to the tournament. It’s a list that Xixo and a few others had success with on ladder and in tournaments recently. This version utilizes Tuskarr Totemic and Thing From Below, which are considered to be two of the most powerful class cards right now. They often create awkward situations for your opponent that could lead you to gaining a significant advantage on the board. Aggro Shaman is so fast paced and has so many tools to apply pressure on the opponent that adding this package does synergize with the deck’s general strategy. Mid Range Shaman’s continuing evolvement is very interesting to follow. There doesn’t seem to be a refined list just yet and there are many opportunities to explore different builds. Loyan brought the old fashioned Al’Akir variant while AKAWonder and GeorgeC chose to bring a Bloodlust variant. Both variants are similar and mostly differ in their end game finishers. Warlock has remained consistent over the past week with Zoo continuing to boast its large ladder presence while Reno shows up at a much more modest percentage. In competitive tournaments though, Zoo’s presence is only slightly higher than Reno lock, the latter continues to be a favorite amongst many professional players. This week has seen significance developments and innovations within the class. We are beginning to see the emergence of new Warlock decks that have achieved success on both ladder and competitive tournaments. If these decks gain more ground, Warlock may soon be almost as diverse as Warrior. In the DPAT Qualifier #2 (EU), Ikarus piloted a Dragon Combo Warlock in his line-up to a first place finish. This deck can either overrun you with powerful minions or just stall until it hits you with a 20 damage burst combo. But, we aren’t done with Dragons! Recently, CLPayton managed to climb to #1 Legend (NA) with Dragon Zoo. The most notable removed cards are Darkshire Councilman, Forbidden Ritual, Dire Wolf and Knife Juggler. These cards all synergize with each other, but so do dragons. In a Warrior heavy Metagame, with opponents often having a debilitating answer to token generation, a Dragon centric package seems to make a lot of sense. In the EU Spring Championships, both Zoo and Reno were present in the finals between Iner and Thijs. Thijs came through with his Reno Warlock, further cementing the deck to be just as viable as Zoo in conquest format, despite its difficulties on ladder. Hunter is another class that just keeps producing new interesting decks to play each week! This week we are featuring decks that have recently placed highly on the legend ladder. Would it be crazy to say Yogged and Loaded Hunter might be a viable archetype of the class? BigTallGuy reached top 10 (NA) with the archetype, and goes as far as saying that Mid Range Hunter is actually inferior to his variant of the deck, due to its dependence on its curve and weakness to aggression. SuperJJ peaked at top 30 with a different list of the archetype, utilizing Azure Drakes and Doomsayers. It also seems NickChipper may have finally refined the Mid Ranged N’Zoth Hunter variant to its most optimal build. His list completely dominates control decks. JustSaiyans’s Mid Range Hunter is still a very strong choice to ladder with as it is probably the least volatile and most consistent build out there. While Thijs’ Mid Range Hunter helped him win the European championship, it was built with the premise of banning Shamans, and utilizes Desert Camels. With the high number of Shamans as well as Zoo, it is not a list recommended to copy & paste into ladder play. Druid is a class on the rise, with C’Thun Druid in particular seeing more play on ladder. During the European Spring Championships though, only AKAWonder brought the class, which he never got a chance to play. His C’Thun Druid list is similar to the one he brought to the Preliminaries, with Cenarius switched in instead of The Black Knight. The most surprising aspect of the list, which generated much discussion, is its preference for Beckoner of Evils over Wild Growth. This build features more early game minions than SilentStorm’s C’Thun Druid, making it better at dealing with aggressive decks. However, SilentStorm’s list is preferred by most players and we believe it is a stronger deck overall. Although continuing to be mostly a fringe deck with small representation on ladder, Token Druid found some success this week with Kno hitting rank 1 legend on NA using J4CKIECHAN’s decklist. 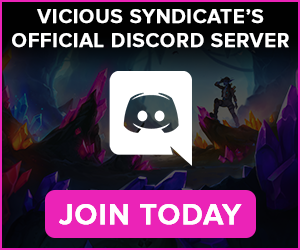 The archetype is very difficult to pilot successfully, with many key decisions to make every game, which could explain why it hasn’t established a significant presence on ladder. Finally, another interesting variant of C’Thun Druid that we wanted to feature is Zalae’s Beast/C’Thun Hybrid Druid, which he used to get second place in last week’s Tuesday Night Hype. At the European Spring Championships, we saw some amount of Mage play. Three of the eight participants brought the class, and all three decks were of the Freeze Mage archetype. The deck performed relatively well, with INER finishing 2nd with it. Freeze Mage is widely considered as the deck that will “make or break your lineup” as worded from the Championships. It definitely was a strong pick for this specific tournament and should be in the near future. Pyroblast has shifted from being standard in every deck to a tech choice as it’s not always needed and can be dead in several matchups but also help depending on your strategy. Pyroblast can make the Warrior matchup very winnable if you are leaning towards a Shaman ban. You can read on last week’s Mage section for more on the subject of Freeze Mage builds and we will keep updating as more developments come up. As for ladder play, Freeze Mage is still somewhat weak because of the Aggro Shaman/Warrior matchups which are common. You will find yourself winning a lot of the other games though and can still find success with patience. Meanwhile, Tempo Mage is finally beginning to see significant success on ladder with Hotform recently hitting #1 legend on NA with his version of the archetype. The deck has an extremely low curve, shedding high value yet slow cards such as Cabalist’s Tome and Ethereal Conjurer, opting to play two copies of Forgotten Torch and two Acolytes of Pain for a stronger draw engine and more direct damage. It will be interesting to see the archetype evolve further and whether it will finally find a spot in the tournament Metagame. Both finalists, Thijs and Iner, opted for the Leeroy/Cold Blood finisher in their Miracle Rogue decks. The difference between the lists is very small: Thijs opted for two copies of Deadly Poison and two Conceals, while Iner chose to play one of each as well as a Shiv and Xaril, The Poisoned Mind. Xaril is a high value card, which is strong against control decks, with the toxin cards often being very relevant. The second conceal can be a dead card at times, and some consider it to be a “win more” choice. Keep in mind that these are tournament decks, and for ladder play, some changes may make the decks more optimal. A second Farseer is, for example, a strong consideration against Aggro decks. Other forms of Rogue are also popping up. GoYugiohPro recently piloted a Reno N’Zoth Rogue deck into top 50 NA. There are also other experimentations happening in the class. Savjz went as far as toying with a Rogue deck that had three of the Old Gods! It remains to be seen whether a non-Miracle Rogue deck finally gains significant traction. It’s the darkest time for Priest players everywhere, what’s left of them anyways. Not a single Priest deck was brought to the EU Championship, where players were required to bring five classes. That is a lot of disbelief in the class. The closest thing we’ve had to actual success with the class lately is JAB’s N’Zoth Control variant with a few different tech choices. The absence of Northshire Cleric might seem odd, but it’s getting tougher to get value out of the card with so many ¾ minions running around. Priest has some incredible spells, and can beat any deck with the correct tech choices, but its lack of minions that can swing the board leave it in a bland state. When Priest’s best win condition is the N’Zoth variant that is strictly inferior to Paladin’s N’Zoth deck (which, by the way, is a pretty bad deck by itself), why ever play it? Blizzard, send help! Priest needs stronger minions that promote a more proactive strategy. Three players brought Paladin to the European Spring Championship. Turna and Loyan had N’Zoth Paladin builds, identical to within one card (Loyan’s Justicar for Turna’s Keeper of Uldaman). GeorgeC brought an Anyfin Paladin build. Throughout the entire tournament, Paladin decks won games… only against other Paladin decks. The competition between Priests and Paladins on which is the worst class in the game continues to heat up! Anyfin Paladin continues to be relatively unexplored, and a recent r/CompetitiveHS post suggested experimenting with other uses for the Control Paladin shell (besides the N’Zoth variant, which might be holding back the class). Both Anyfin and other Paladin archetypes could certainly use some research, but until a new list breaks out, Paladin will remain bottom tier in the current Metagame. With our increasing amount of data and our ability to calculate observed win rates in combination with deck frequency, we’ve developed a formula that can point towards the relative strength of every common archetype in the Meta against the field. The following table shows decks ordered by “expected win rate”. This number tries to answer the following question: if you queued up 100 games with a specific archetype against a specific Meta, how many wins would it pick up on average? This number is influenced by two dynamic factors that are always changing: its matchup win rates against other decks in the Meta, and how common these decks are. 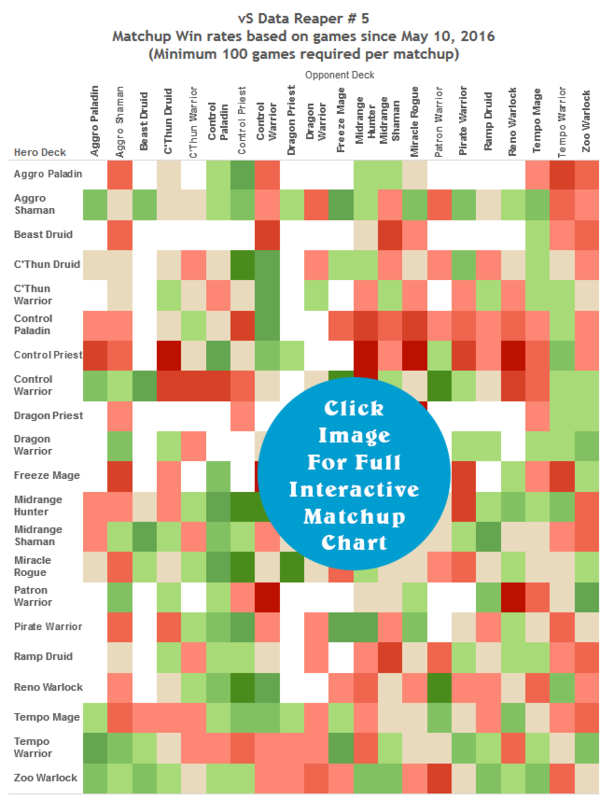 Just like our frequency chart, this table is also interactive, and you can see a deck’s ‘power’ at different ranks. Of course, there are many variables that can alter a deck’s performance from the expected win rate, such as the individual’s proficiency with the deck, understanding of certain matchups, as well as tech choices which can be critical. However, we believe that this ranking shows the inherent advantage or disadvantage of an archetype against the field. After we calculated the numbers, we were impressed to see many of our previous week’s “Meta Breakers” sitting at the top. Of course, we will continue to refine this metric in the future and develop it further while providing it to the community on a weekly basis. You can consider every deck with a relatively high “vS Power Ranking” to be an inherently good choice to play on ladder. 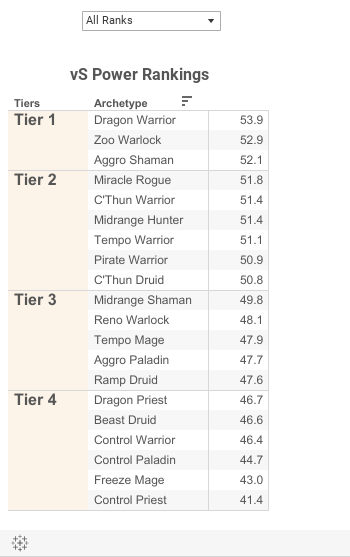 Two of the most powerful decks according to this metric are Zoo and Dragon Warrior. So why not combine them? Dragon synergy cards are very strong in the current Metagame. Adding them to the powerful Zoo archetype is an interesting idea that Payton adopted with great success, piloting the deck to #1 legend on the NA ladder. The Dragon Zoo variant should be stronger against the Warrior class, and it’s less susceptible to AOE, which might give it an advantage in the current Meta over standard Zoo.